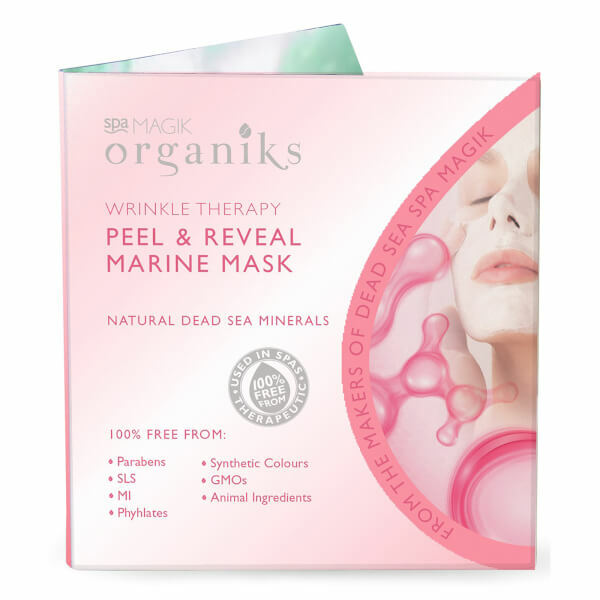 Submerge skin in nourishment with the Spa Magik Organiks Wrinkle Therapy Peel & Reveal Marine Mask; an anti-ageing formula that refines the complexion. Simply combine with water and the formula transforms into a rich face mask that dries within fifteen minutes and can be peeled away effortlessly. Enriched with Vitamin C and Algae extract, the mask envelops skin in a supercharge of nutrients that works to reveal a radiant complexion. Once peeled away, wrinkles and fine lines are visibly reduced, leaving the complexion smooth and youthful. Free from Parabens, SLS, Phthalates, Animal Ingredients, Gluten and Dairy. Suitable for Vegetarians and Vegans. Mix into a smooth paste using 90ml of warm water. Using a spatula, apply a thick layer to the face. Leave to set for 15 minutes before gently peeling off to reveal a more youthful-looking complexion. Diatomaceous Earth, Algin, Calcium Sulfate Hydrate, Tetrasodium Pyrophosphate, Cyamopsis Tetragonoloba (Guar) Gum, Sodium Ascorbate, Maltodextrin, Malpighia Punicifolia (Acerola) Fruit Extract, CI 12085, CI 15985, Parfum (Fragrance).